Today came and went without me getting a picture of anything of interest. So, this is what I'm left with now that the kids are all in bed. We found these beauties at Kohl's yesterday. They were on sale. Buy one get one for a dollar. That's hard to pass up. But the deal gets better. We had an additional 30% off with our mailer. 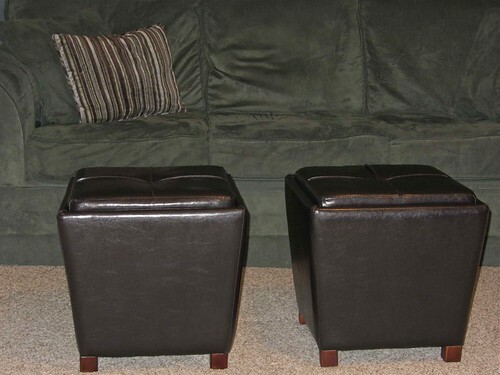 Plus inside each of these footstools is another smaller footstool. So really it's four for the price of less than one. Another nice feature is the top comes off and can flip over into a tray. Mickey, Kade, and I played a game of Farkle on it. I did have to put my foot down about the abuse the kids were giving the new footstools. They were treating them like lily pads and they were the frogs jumping for one to the next.